Hanger Café, Quai des Chartrons, Bordeaux, France. 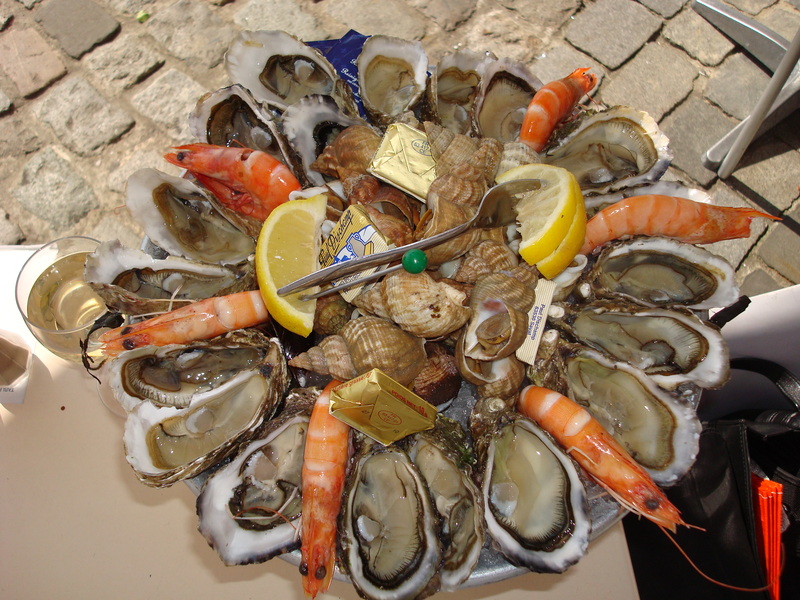 As a result of the 18 oysters, as many sea snails (bulots), 6 big prawns, and a few mussels I had for lunch on my last day in Bordeaux, I am awash in a sea of benessere — wrong language, right feeling. Did I really think I’d leave here without one extravagent gastronomic gesture? Exactly who did I think I was kidding? I found a café in the sun along the river in the Chartrons district, a twenty-minute walk or easy tram-ride north of the city center. Once seated, I started to read the new novel I had bought, appropriately titled given what and how much I was about to consume, Une gourmandise, by Muriel Barbery (available only in French, but her new well-received novel, L’élégance de l’hérisson, has now been translated as The Elegance of the Hedgehog. But I digress.) I read quite a few pages before the food showed up at my table. When the server placed the platter of oysters, prawns, and snails on the metal stand before me, I ate nearly everything on it, plus drank two glasses of a refreshing sauvignon blanc Bordeaux wine. The oysters soaked in the puddles of liquor in their shells. Once disrobed of their shells, the prawns were tender and even more delicious when dipped into accompanying fresh (I swear) mayonnaise. The snails caught me completely by surprise, because they had a subtle but distinct flavor that reminded me of Five-Spices, or maybe one constituent spice therein. I couldn’t put my finger on the name of it. I asked the server who looked like he was in charge what could the spice possibly be. He said the snails were prepared with no spices. I didn’t believe him, but was willing to let it go. They were chewy but not rubbery. I took my time. Barbery’s novel lost the competition for my attention. That platter held a lot of shellfish. I was a pig. The cost of the platter and two glasses of wine was unreasonably high for one person. For two people, however, it would have been a bargain. I paid 34 euros for a very good shellfish lunch.